• One bedroom is downstairs, far from the other bedrooms upstairs. Good for those unable to climb stairs. • Baby-proof features: covered electrical outlets, baby gates on stairwells, and safety latches on cabinets with hazardous cleaning products. • Two bedrooms have cable television, and the master bedroom also has a DVD player. • Cable TV is also in the kitchen and upstairs loft. Amazon Fire Sticks on all 4 TVs. Built in 1890 by Robert Todd Lincoln's best friend and law partner, the Edward S. Isham House is only 1.5 miles from the heart of Manchester Village with its charming boutiques and galleries. Walk down the marble sidewalks of Manchester to enjoy excellent restaurants, a wonderful bookstore, perfect cafes, and some of the finest outlet shopping available anywhere. The Isham House is nestled in the valley between the 3,816 foot Mount Equinox and the imposing Green Mountains. From the front door of the Isham House, you can go hiking up and around Mt. Equinox. Within a short drive, you can go biking, kayaking, or fly-fishing on the famous Battenkill River. Located on the main road passable in all weather, the Isham House is only a 10 minute drive from Bromley and 20 minutes away from Stratton ski area. If you prefer, walk around the corner to Hildene -- Robert Todd Lincoln's estate -- and take a tour of its lovely Georgian mansion, or go cross country skiing through its groomed trails and finish with a hot chocolate in its quaint warming hut. As hosts, we will welcome you as family. We provide you with recommendations for local eats, shops, sights and countless activities. My husband, Jed, and I live in Chicago, IL. I am a digital organizer, and Jed is an independent school administrator. We love to hike in Vermont with our kids and standard poodle, Rufus, and look for out of the way swimmin' holes. Jed's family has owned the Isham house since 1991, when it was a run-down working barn. Jed's father Bernie could see the building's 'good bones' and renovated it to it's current beauty. We take a tremendous amount of pride and joy in offering it to other families to enjoy. We converted the Isham House into a home because the area offered us a rare mix of outdoor activities, culture, history, and outlet shopping. You can walk to the trails of Mt. Equinox from the front door. We are on the main road and are only a 5 minute drive from town. 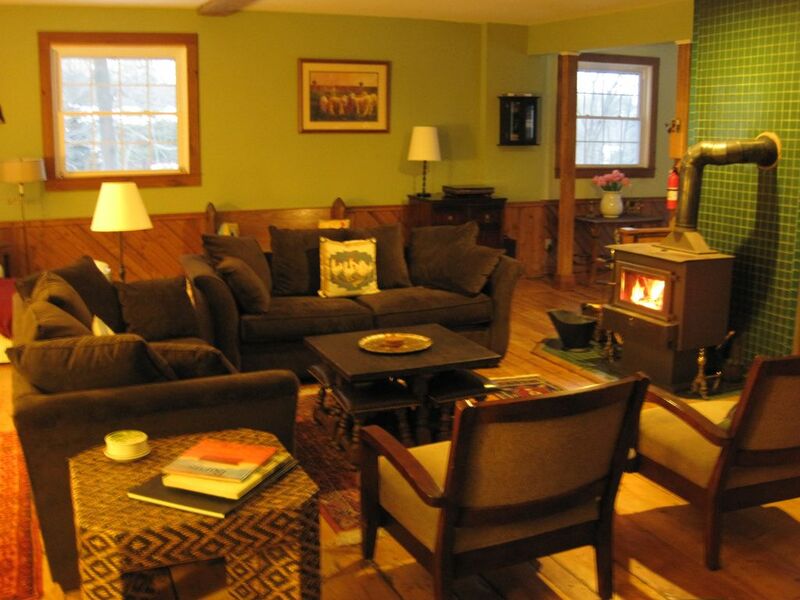 The house is large enough to sleep 14 people but cozy enough for a perfect Vermont weekend getaway! The Master Bathroom has a jacuzzi bathtub for weary bones and original plank floors. The Upstairs Bathroom has a new tile floor and a fully stocked towel closet. The Downstairs Bathroom is handicapped accessible with support bars on the walls and in the shower. We offer two window units in the summer months. We have an awesome collection of old LP's. The Isham House has a number of baby-proof features: covered electrical outlets, baby gates on stairwells, and safety latches on cabinets with hazardous cleaning products. What a great place. Family friendly, well stocked with plenty of room for everyone to spread out. Great location, close to town and ski area. Lilly was very response to our questions and returned the security deposit within the week. Overall, cant more highly recommend. The house was very clean and much more spacious than it looked in pictures. We were a big group and everyone had space to sleep. The kitchen was great for cooking and fully stocked with a big island for people to hang out. Supermarket and shops are about 10 minute drive away. Overall we had a great experience! Perfect spot for a family gathering, close to everything. Very nice property. Spacious and clean. We had a nice large family gathering and this property accommodated us all well. We will return again!! The spacious house was very comfortable and had all that we needed for our xtended family. Certainly provided memories that we will cherish. The host/hostess were there by email for us with any questions and supportive throughout our stay. Thanks so much. Lilli is such a great host and the house is always so warm and cozy. Plenty of space to spread out but also spaces to gather as a group. Will always keep this in mind when booking our VT trips. Very Warm and Comfortable Home! Our host Lilli has a lovely home that is very inviting. It has plenty of space for two families and is well stocked in every way. The kitchen has almost everything you might need to whip up a great meal. This was our third stay in the home and have another visit already planned. Will definitely stay there again in the future. Thanks to Lilli for being such a great and responsive host! Cheers! The Historic Edward S. Isham Carriage House sits on Historic Route 7A in the town of Manchester. Because of its rural location, it is sometimes difficult to find the Isham House on GPS or Google maps. To see its exact location, Google 'Ormsby Hill Inn' in Manchester. The Isham House is directly adjacent to the inn (approximately 150 yards to the north). Golf: There are two remarkable golf courses near the Isham House. Gleneagles, owned by the Equinox Resort, is a links style course that is beautifully maintained. Stratton Mountain also boasts a course that has hosted LPGA events in recent years. Ski: The Isham House is smack dab in the middle of ski country. Stratton Mountain -- known for its deluxe facilities, gondola to a 4500 foot summit, and sun bowl -- is a 20 minute drive away. Bromley, a resort renowned for the quality of its ski instruction and challenging terrain, is less than 15 minutes from the house. Magic Mountain and Okemo are also options nearby. Hildene -- adjacent to the Isham House -- offers groomed trails for cross country skiing. Having undergone an extensive renovation on the last few years, Hildene is an excellent destination for those who like to keep their skis on flat ground. Please contact owner to confirm rates. An additional $50 security deposit is required when bringing pets.